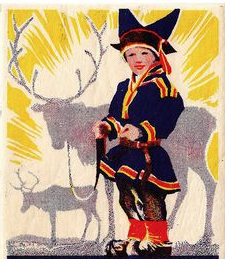 Here is a beautiful song, "Gula Gula", by Norway's greatest Saami singer, Mari Boine. Mari Boine Persen is known for having added jazz and rock to the yoiks (traditional singing style) of her native people. Boine (born in 1956) grew up amidst discrimination against her people. She was asked to perform at the 1994 Winter Olympics in Lillehammer, but refused because she perceived the invitation as an attempt to bring a token minority to the ceremonies. "Gula Gula" (1989) was her breakthrough release (her album was discovered by Peter Gabriel), and she continued to record popular albums throughout the 1990's. She is gifted with a magnificent voice, highly delicate and able to reach an absolutely phenomenal guttural power. 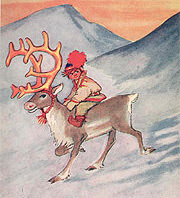 Enjoy this little tribute to the great and beautiful Saami culture!